Niccolo Chengdu has won the illustrious award for “Best Business Hotel in Chengdu” at the 25th annual Business Traveller Awards. The muchanticipated event was held at the Conrad Hotel, Hong Kong last Friday in front of some of the industry’s most influential leaders. Located within the city’s celebrated International Finance Square (IFS), Niccolo Chengdu is located at a prime address within the city’s financial and business area. The fashionable, contemporary hotel offers the seasoned traveller a choice of 230 spacious, luxurious guestrooms and suites that reflect its understated sophistication. In addition to its centerpiece Niccolo Ballroom and The Conservatory, the hotel offers a range of 18 meeting rooms. The first hotel under the new luxury brand, Niccolo Chengdu opened its doors in April 2015 in Chengdu, China. Since then, the contemporary urban chic hotel has won numerous accolades, including “China’s Best New Hotel” by Travel + Leisure China edition, Ctrip’s “Best Hotel Facilities 2015,” “Best New Hotel” at the 2015 China Travel Awards and “Best Design Hotel 2015-2016” by Talk Magazine. 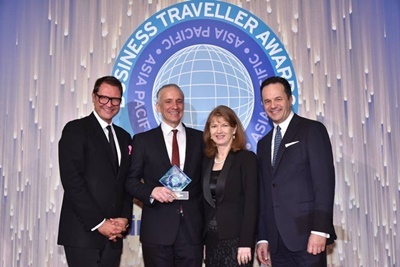 The results of the Business Traveller Awards are based on a voting poll by its subscribers, who are some of the region’s most frequent travellers. Results were compiled and tabulated to determine the winner of each category.